I have no trouble with people who charge hourly. I just want to make that clear at the outset. And if this practice has worked well for you, then I’m delighted for you and I wish you all the best. There are clearly some business models that work very well on an hourly rate. So I’m not suggesting, by my title or by this topic, that they don’t exist or that they can’t be lucrative. I’ve heard people say that they have a fixed hourly rate and when they notice they’ve not turned any business away (presumably because their rates were too high), they raise their rates. I can see how that could work. Especially because you’re charging for a scarce resource – you. Your knowledge. Your experience. And since there’s only so much you to go around, it makes sense to keep pushing the rate up in direct response to market forces. I know others who just set a flat rate based on their own perception of their own worth. And I can see how that could work. They recognize that they’re not a $200/hr developer, but rather a $50/hr developer, and so that’s their rate. Whatever they do, regardless of task, is at that rate. I know others who break out different rates based on the task. And I can see how that could work. After all, coding and testing could be done by different people with different levels of experience. And each task would have it’s own rate – one for development, another for testing, a third for design, and a forth for project management. I can totally see how each of these could work. I just don’t do them. The first problem I have with these approaches is that there is an inherent limit to the total revenue you can pull from the market because there is a limited number of hours in a day, week, month and year. Sure, you could grow, but at a cost. And eventually you can’t scale because the more you grow, the more overhead in management you experience, which has a cost that frankly no one ever wants to pay. It’s part of the cost of doing business. So your operational profit margin will shrink over time. And that’s if you’re lucky enough to grow. If not, you’ll just grow the amount of hours you work. Goodbye work-life balance. The second problem I have with these approaches is that people easily get anchored with a price. Customers who were quoted $50/hr are unlikely to believe that you have increased your worth by $25/hr in 6 months, but it’s possible to do (by training or tools). Your knowledge will increase faster than people will get unanchored, and that will result in one thing: new rates will only be for new customers (and you’ll start hating your old customers). The third problem I have with these approaches is that they don’t take into account some fixed admin costs that you’re likely to develop over time. I’m not talking about life insurance or health benefits – but both are worth noting. I’m a full time employee for a company, so my consulting is on the side. I don’t have to worry about those additional costs, thankfully. But I do have admin costs. I pay for hosting. And most importantly, I pay for frameworks. I pay for Genesis. I pay for Catalyst. I pay for Gravity Forms. I pay for Elegant Themes. I pay for WooThemes. I’ve paid for tons of WooCommerce extensions. These are all tools that I have at my disposal so that I can get something done in minutes or hours instead of days or weeks. I like the people I partner with (my clients) to deliver value. I like their projects. I want them to succeed. Nothing miscommunicates more than an hourly rate when it comes to that – making it my fourth problem with hourly rates. With an hourly rate, the incentive is to make things last longer – taking my clients hostage. Yes, they’re reliant on me (and me them), but I don’t want to create a dynamic that so poorly articulates what a win-win is for both of us. They’ll always assume I’m trying to make more money. I’ll always assume they’re trying to take money out of my tech fund (and that’s not a good thing!). The last problem I have with these approaches is that they don’t rest on the thing that both of us want the most – the best value. When I go to a tax specialist, I don’t pay him for the forms he fills in. I don’t pay him for the minutes he spends looking over my files. I pay him to make sure I’m paying the right amount of taxes and that I won’t get hit later with some penalty because of my dividend checks, capital gains, and stuff like that that I don’t understand so well. I want value. I want him to keep my costs down and me out of jail. He wants to be paid for the expertise he’s developed over time. As long as we can agree on a value, we’ll both win. Now, here’s the thing. The value I have for no fines and staying out of jail is very different from the value that Bill Gates has for the very same thing. Why? Because his fines would be way higher, and the cost of him being locked up way higher. He has more on the line. So he has a greater value. Which means he should pay his tax guy more than I pay mine. I’m not a programmer much anymore. I’m not much of a designer. My plugins aren’t complicated, and the websites I work on aren’t incredible works of beauty. Those aren’t areas where I specialize. (Note: If that’s what you’re looking for, I’m friends with tons of folks who are incredible.) But I design products. And I manage people – software people – specifically. And I know how to leverage WordPress to not only build those products, but also how to use it to help you launch and monetize those products. Plus raising money. Plus hiring and training high performing teams. Plus managing remote staff. I have a pretty good track record of all that. And that’s the value I bring to organizations that need that kind of help. They pay what I charge because I can help them anticipate better. They pay what I charge because I can help them accelerate faster. They pay what I charge because we agree on the value of what I’m bringing to the table and how important it is to them (whatever their context may be). 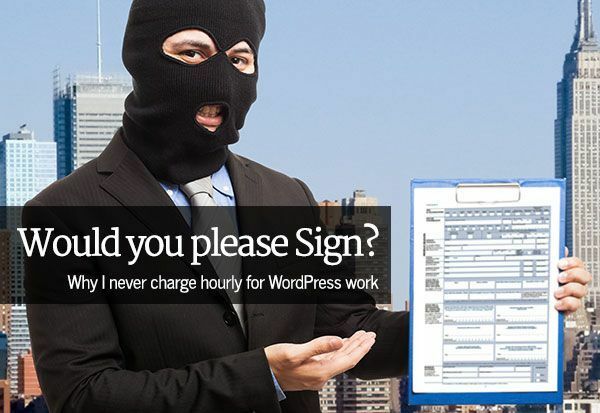 And that’s why I don’t charge hourly for WordPress (or any other kind of ) work.